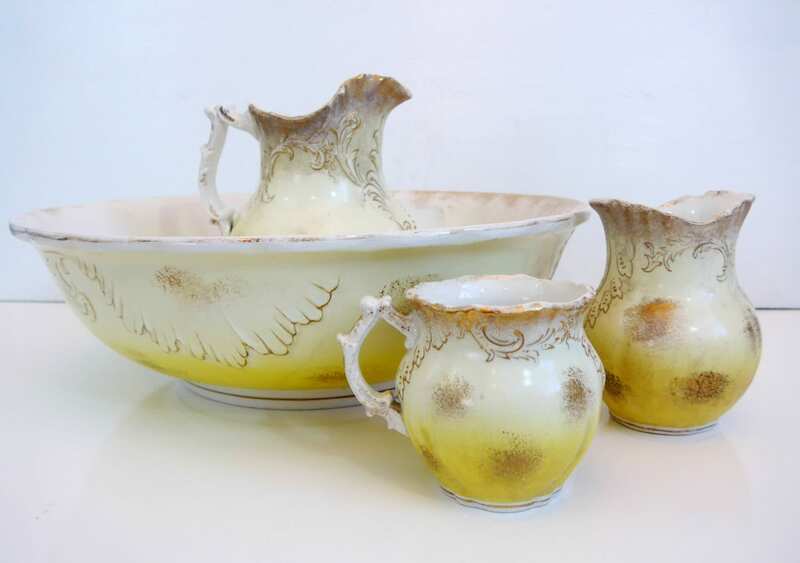 This antique bath or toilet set made circa 1893 by the Maddock Co. of Trenton, New Jersey is an ivory color with a pale yellow on the base that fades upward and has gold spatter or sponge accents in various random places. 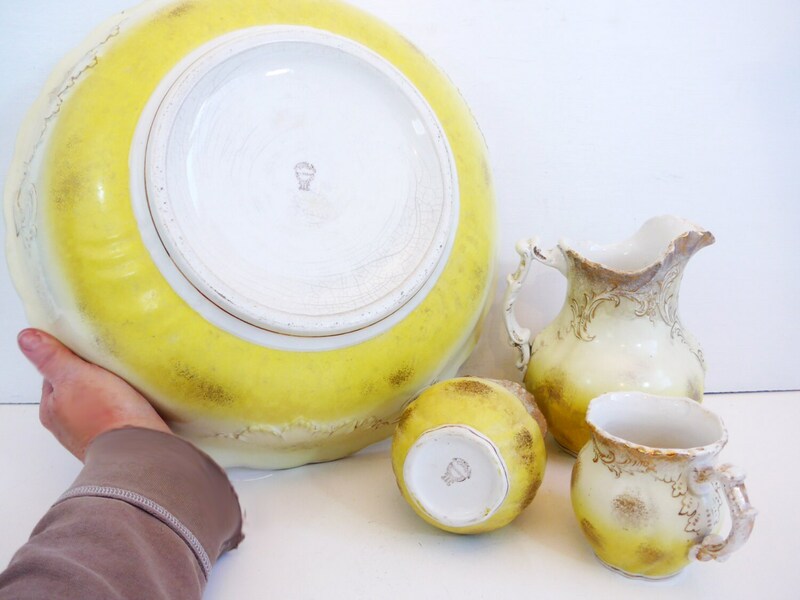 The four pieces are a large bowl, a medium sized pitcher, a small pitcher and a toothbrush jar. There are embossed feather-like embellishments on all pieces - see photo #2. The handles on the two pitchers are very decorative. There is a fine gold band at the base of all of the pieces. The pieces are all shabby chic with crazing and wear - they are approx. 120 years old. Specifically, there is a chip both on the medium pitcher near the spout and on the top edge of the toothbrush jar. The small pitcher and the bowl have no chips - there are lots of signs of wear but no significant chips. The bowl shows a great deal of wear - there is crazing all over, discoloration, some cracks on the inside in a few places and the gold band around the bottom is almost worn completely away. See photo #5 with the circles around the places to show the significant chips on the pieces and the wear areas on the 4 pieces. The hallmark is clearly soon on the bottom of all four pieces and it says Maddock's Lamberton Works and Royal Porcelain. The company was one of Trenton's most prolific china producers. This set is one of their earliest pieces. See NOTE below about the Maddock Co.
Bowl is 15" diameter and 5" high. Larger pitcher is 7 1/2" high. Smaller pitcher is 3 1/2" high. Toothbrush jar is 5" high. Great antique shabby chic decor bathroom or bedroom set. 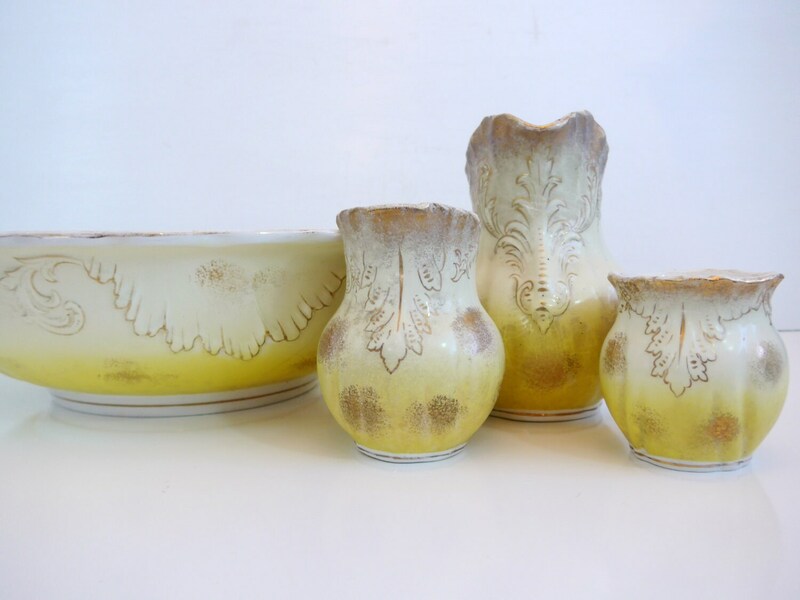 The backstamp on these 4 pieces dates them to the early 1890s. 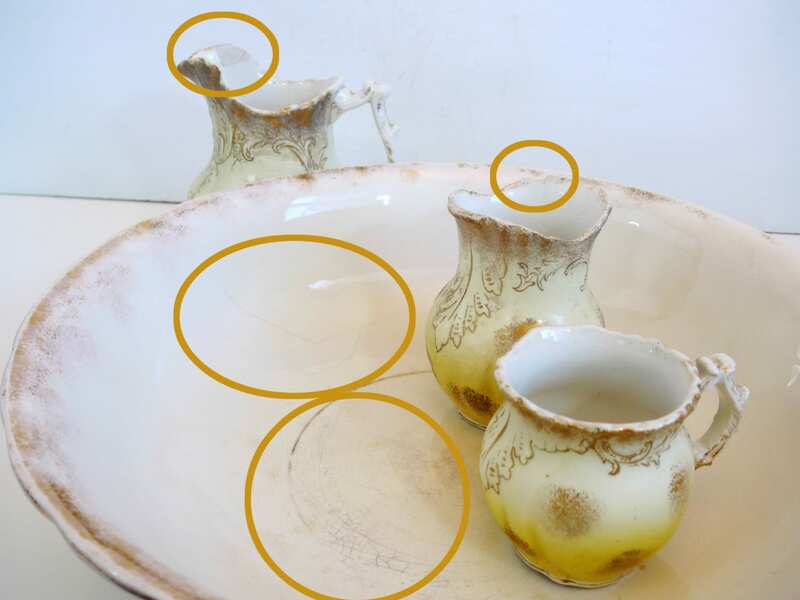 This particular circular mark topped by a stylized "M," "Maddock's Lamberton Works" within the circle and "Royal Porcelain" below indicate the piece was made at the turn of the last century by the Maddock Pottery Co. This is a very heavy set and quite a large package for shipping. By 1873, Thomas Maddock whose family was well known in the pottery business that they had in Burslem, Staffordshire, England, made his way to Trenton, New Jersey and formed a profitable partnership with Millington and Astbury manufacturing earthenware. 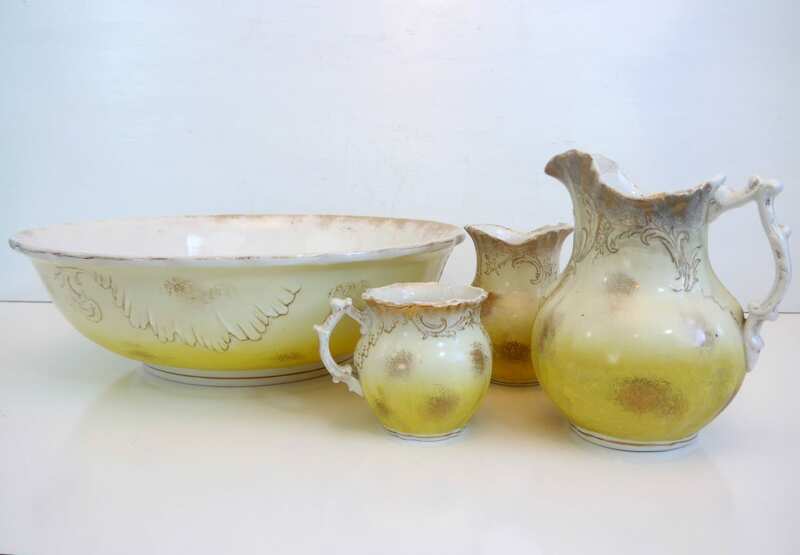 They produced “toilet sets” – wash basins, pitchers, chamber pots and slop jars, mugs and toothbrush holders – dinnerware, and other household pottery utensils near the turn of the century. Later on the company produced find and unique china patterns for the country's best hotels, restaurants, clubs and railroads.